Some things were perhaps best left in the 1980s, but not boba, aka bubble tea. 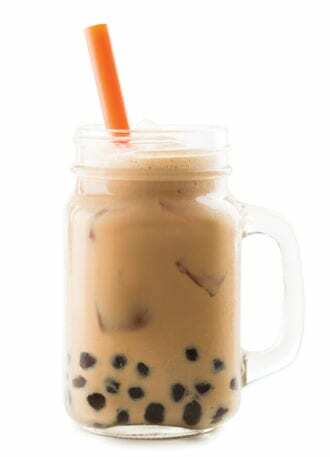 Named for the squishy, over-sized tapioca pearls that bounce along the bottom of the glass, boba tea was first mixed in Taiwan in the late ’80s, and has since spread worldwide. We love bubble tea for its instacooling effect and the chewy pop of flavor that comes from slurping up boba balls through an oversized straw. There are methods aplenty for mixing up a batch of your own, but to keep things as fresh as possible, we chatted with Erica Swanson—owner of Portland, Oregon’s Tea Bar and our 2017 Tea Person of the Year—for her formula for Hong Kong–Style Boba. The secret? Forgoing powders and flavored syrups in favor of strong-steeped tea, sweetened condensed milk and boba balls fresh off the stovetop. Steep tea in 6 to 8 ounces of 200-degree F water for 3 to 4 minutes. Strain the tea. In a shaker, add the steeped tea and sweetened condensed milk and stir to combine. Let the mixture sit for 5 to 10 minutes to allow the tea to cool, then shake with ice. In a separate glass, add the prepared boba pearls and top with ice. Strain the tea mixture into the prepared glass and serve with an oversized straw. To prepare the boba pearls: In a large pot, bring 4 cups of water to a boil. Add 2 cups of tapioca pearls and boil for 5 minutes. Reduce the heat to medium low and let simmer for 20 to 25 minutes. Remove from the heat, strain the boba, and cover in a 1:1 simple syrup made with raw, unrefined sugar or 1:1 honey syrup. Let the boba soak in the syrup for at least 10 to 15 minutes before using. Refrigerate the unused boba in syrup for up to 4 to 6 hours.